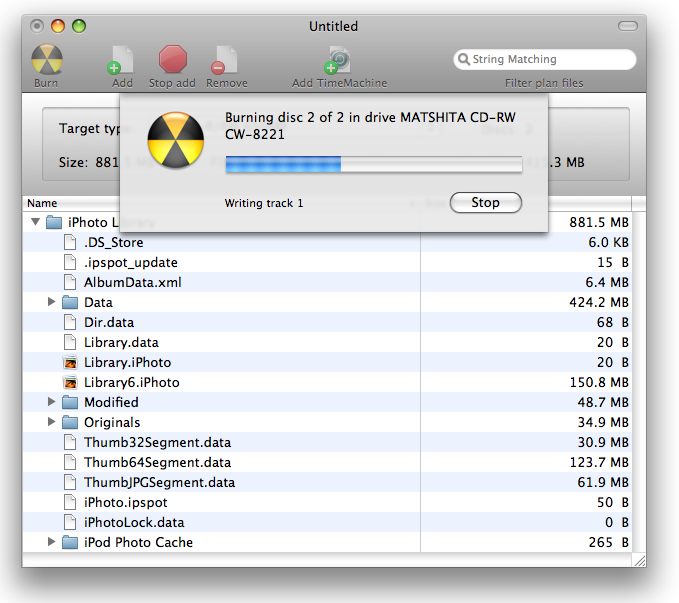 These screenshots help to walk through using ArchiveMac through various scenarios. Click on any screenshot to see a larger image. Create new plan starts a new archive plan. Archive plans can be saved. Saved plans can be used to burn another set of discs with the same files or plans can be altered and extended. Restore allows you to restore one or more files from a previously burned set of archive discs. 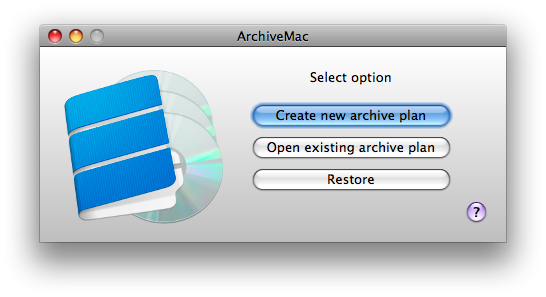 When this option is selected, "ArchiveMac" searches for a mounted disc burned using ArchiveMac. You may add files either by dragging and dropping from Finder, or by pressing the Add Files icon in the toolbar, or by selecting Edit/"Add file or directory" from the menu bar, or by pressing Command-K. Files maybe removed by selecting the file, set of files or directory and pressing right mouse button then "Remove files", or by pressing the remove files icon in the menu bar or by selecting Edit/Remove from the menu bar. The search field can be used to find files or directories with a given name in the current Archive plan. Adding a large directory may take some time. You can queue up additional directories to be added while the first directory is being added. You cannot delete items while a directory is being added. If you have added a large directory, you can stop the add directory processing by pressing the Stop icon in the toolbar. The type of disc used for Archival must be selected from the "Target type:" list box. As files are added, and if the target type is changed, information panel is updated to show the total archive size, number of files and number of discs which will be required. The space remaining on the last disc is also displayed. This can be used to optimize your use of discs. You can add more files to fill up the disc, or remove some files to use fewer discs. The plan can be saved at any point by selecting "File/Save" from the menu bar or Command-S. Note: When navigating through file trees in Mac OS X, usually pressing the Option key while expanding a branch in the tree will expand all branches from there down. Use this with caution. 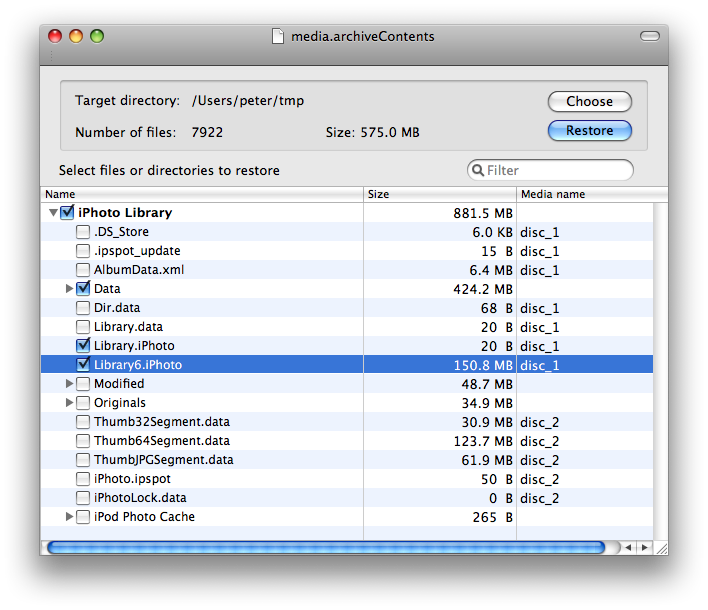 On large directories, especially when using Finder, it may take a long period of time to expand the tree. If you have a TimeMachine backup and would like to archive files from there, click on the TimeMachine icon in the menu bar. 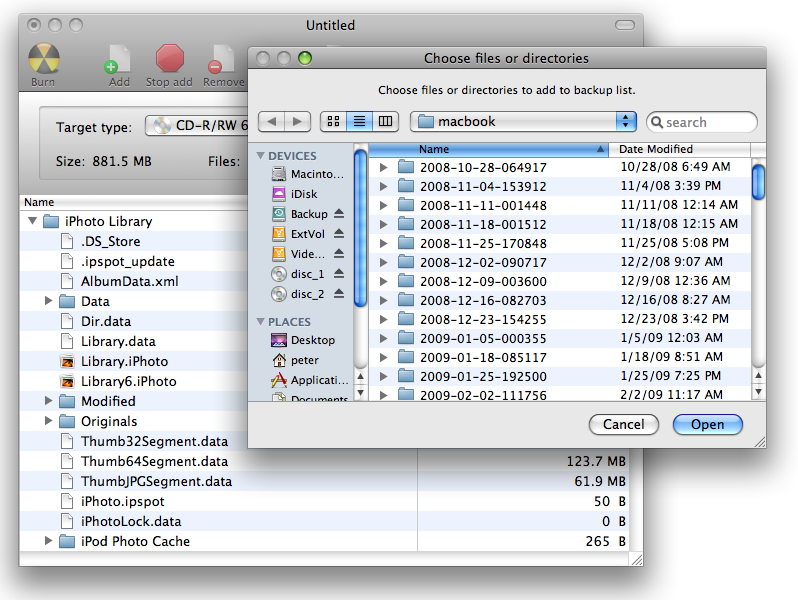 This presents a file open dialog listing the various date and time marked backups which TimeMachine has performed. Each TimeMachine backup represents your entire machine. You can drill down within any particular date and time backup and select one or more files and or directories to add to the Archive plan. To burn the Archive to disc, press the "Archive" button, or the "Create archive" icon in the toolbar. A burn setup panel is presented. It allows you to pick whic burner to use, if more than one, options to erase and verify the disc etc. 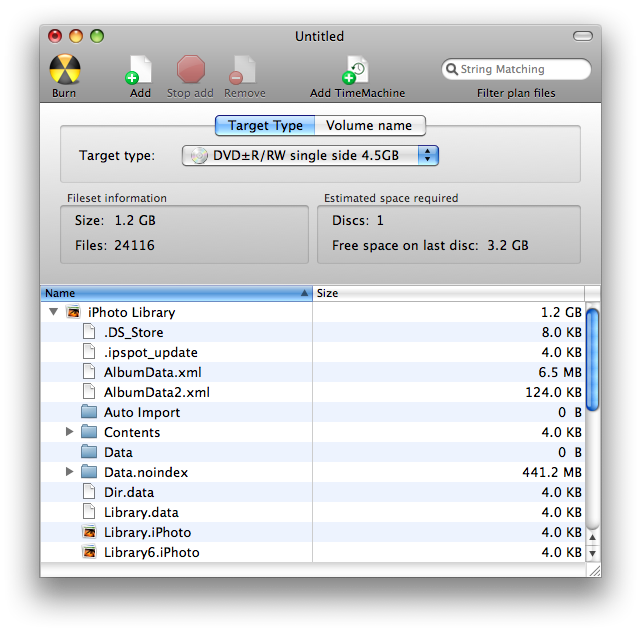 Note: Only those drives which support the selected target type are shown as available. Select "Burn" to burn the disc. Process continues for all discs in the Archive. Insert a disc previously burned using ArchiveMac into a drive. Select "Restore" from the initial window (link above) or select "Action/Restore" from the menu bar. This scans available drives for an ArchiveMac archive. The view displays files and directories present within the entire archive set. The view shows all files within the set including those on the inserted disc as well as all others in the set. Each file or file segment is labeled to indicate on which disc of the set that particular file resides. Select the files or directories to be restored. All the files and directories can be selected by going to the menu bar and selecting Edit, "Select All" or by pressing Command-A. If a directory is selected, all files in that directory will be restored. Any directory which is partially selected is shown in bold text. Select the target directory. The target directory is where the files will be restored to. 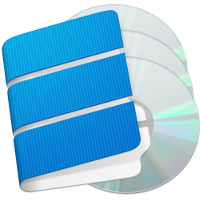 Files which are larger than will fit on one disc are split into segments. To restore the file, select the file, not its individual segments. During the restore, you will be prompted to insert the appropriate disc.